Machu Picchu sits at an elevation of more than 2400 metres. The land in Lares Valley is lush and fertile. 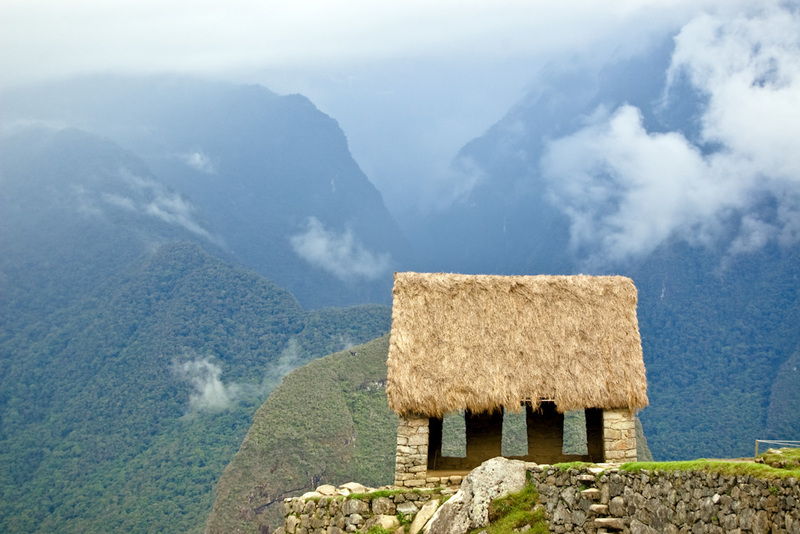 One of Machu Picchu’s several thatched huts. 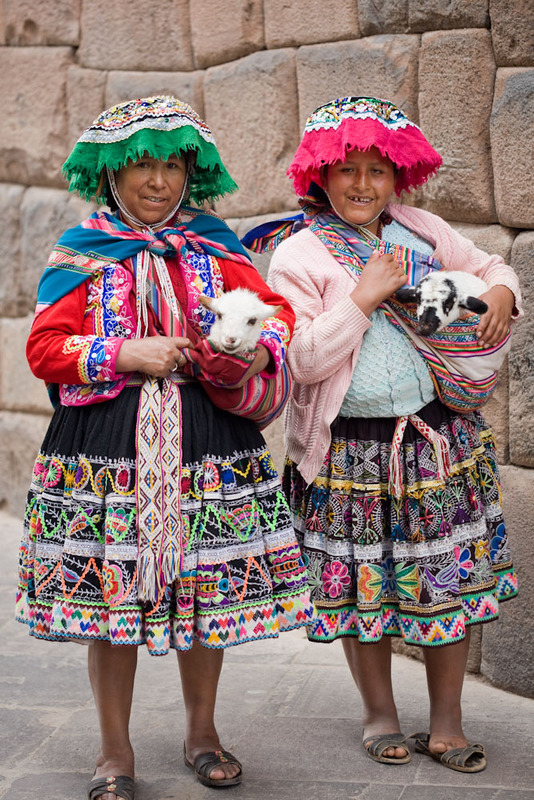 Two Peruvian women in colourful and traditional attire. 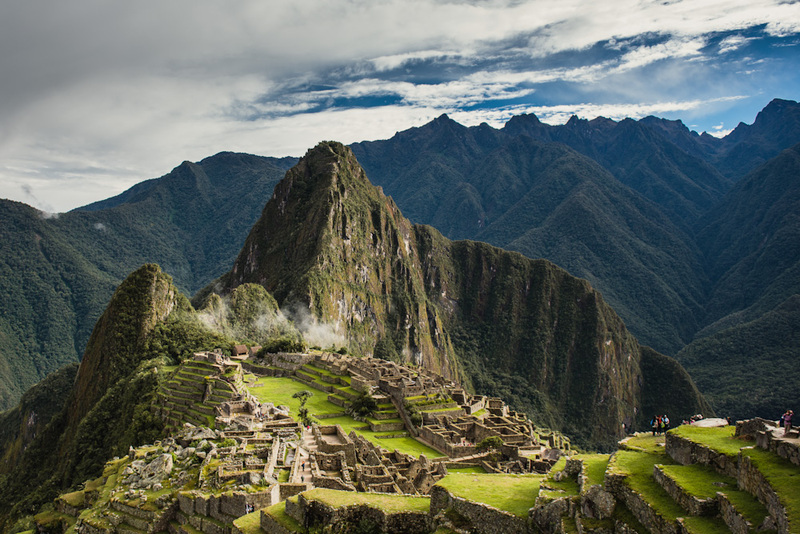 1.4 million tourists visit Machu Picchu each year to see this spectacular view. Plaza des Armas in Cusco boasts some amazing displays of architecture. The Temple of the Sun is located in the city of Cusco. 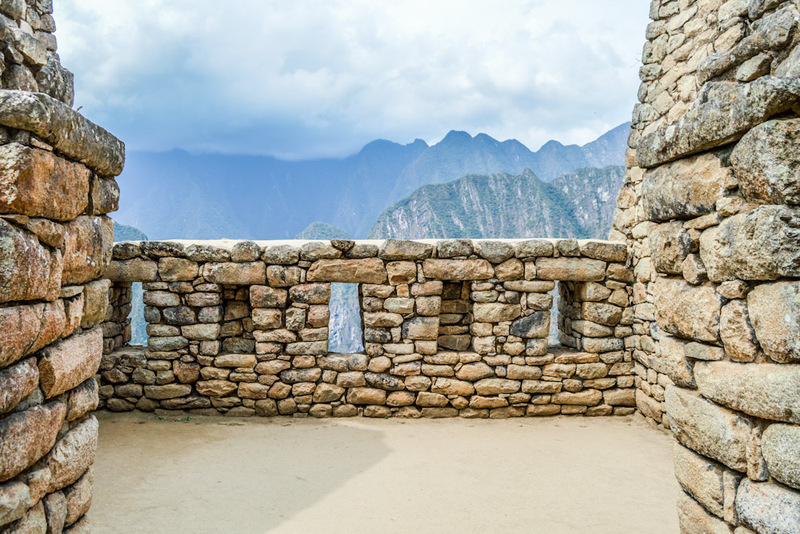 The sheer precision of Machu Picchu’s ancient walls is impressive. 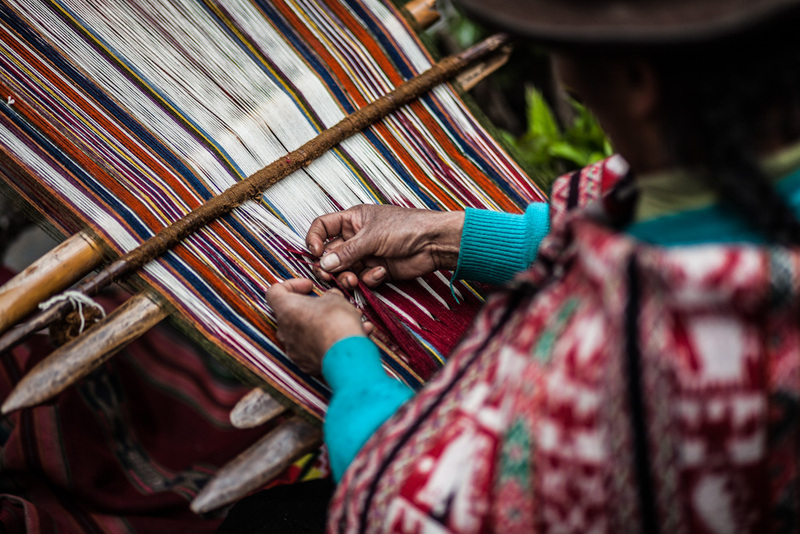 The traditional art of weaving is still an everyday activity in this part of Peru. The Sacred Valley region runs between P’isaq and Ollantaytambo. …and discovers hidden communities that have remained unchanged for centuries. 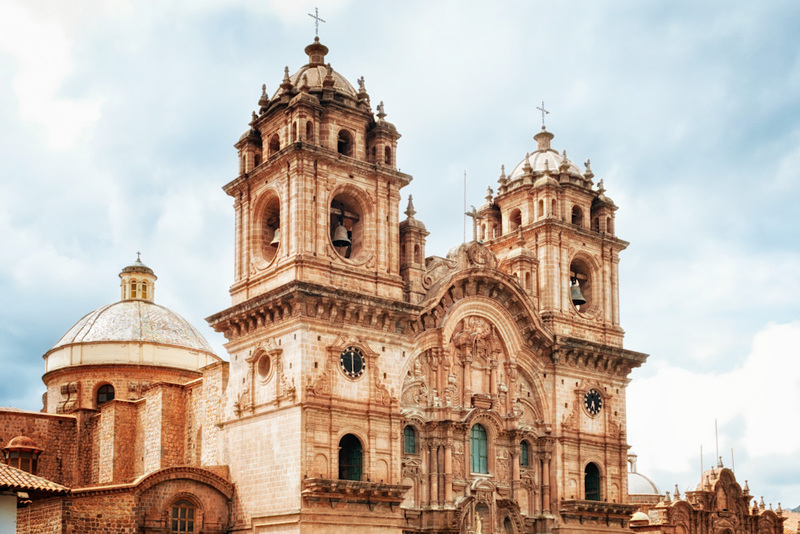 We’ve ventured from the bright lights of Cusco, where touts compete for every tourist dollar (the only Spanish you need learn here is ‘no, gracias’) to a different kind of Peru altogether, far from the American fast-food chains and mandatory Irish pubs. Here, old ladies shepherd lambs by the side of the road as young boys ride past on horseback. We’re driving along a dirt road that drops into a valley a kilometre straight down. Despite the wildness of the topography, there’s order to this plunging landscape; the Incas didn’t let the world’s highest mountains stop their progress. Hillsides are terraced ever so neatly, huts arranged symmetrically, and water gushes from five-hundred-year-old aquaducts amongst it all. The wheels on our 4WD teeter near a drop-off but, with a burst of acceleration, we skip across the mud and onto a rocky trail. We travel onwards and upwards, my ears popping as we climb. I’d had only a day in Cusco for my body to adjust to the fact that I’m four kilometres higher than where I normally breathe air. But today’s hike – like most on this tour – will be gentle, Sutta assures me. And he looks honest. We stop at a small farming village where two old ladies wait for us in pork-pie hats, with heels so cracked I can almost see through to the other side. They lead donkeys which will follow us to our destination: the tiny village of Viacha, reachable only by foot. We pass tiny huts built from stone once ripped from the mountainside. Young children walk by, holding the hands of their mothers and wearing sandals, despite the fact we’re at 4500 metres, and it’s five degrees. I make it to Viacha by early afternoon, in time for a traditional meal under hot stones called Pachamanca. Guinea pig is a delicacy in these parts and, so as not to offend, I take to the rodent-like corpse with feigned gusto. I use my fingers; it’s the only way to eat guinea pig as there’s more bones on these things than on a quail. It tastes like chicken, but then what’d you expect? It’s just us here amongst the farmers who watch us eat, snickering as we battle the bones. I finish being polite and move on to far fleshier beasts. After lunch we stroll down through a dramatic landscape of huge ravines and plunging canyons, passing no tourists – just a group of sullen schoolboys who walk two-and-a-half hours each day, each way, just to go to class. Their pre-teen calf muscles already look like they’re carved from mountain granite. Next to theirs, my chicken legs look like they might snap. A lone condor circles as we walk around the ancient ruins at P’isaq. After a day spent far from any other tourists, the handful of visitors here feel like an imposition. I can only imagine what Machu Picchu will feel like. We’re taken by 4WD to Lamay Lodge, a hotel built especiallyby Mountain Lodges of Peru for those on this Lares Adventure tour. In the soft twilight I lie in a jacuzzi beneath 5000-metre-high mountains, in a green garden whose grass is tended by a pair of alpacas. They startle as I run across the lawn under a billion stars, in only my underwear. Because Mountain Lodges of Peru (MLP) get it – not every traveller to Peru’s highlands wants to spend months training for a hiking expedition to Machu Picchu – they’ve come up with a new multi-activity option that offers visitors an experience far beyond the Inca or the Salkantay Trail. And so I won’t be hiking at all today. Guests are given an option between hikes and cultural activities each day. My skin generally crawls at the mere mention of the term ‘cultural activity’, which generally refers to market visits or watching old ladies weave as if they were in cages (and so often with the enforced option of buying the weaved item), but MLP’s version goes far beyond the cliché, and into parts of Peru still blissfully safe from the ravages of mass tourism. We set out in 4WDs across some of the most glorious – and loneliest – landscape on this planet. This part of the region, the Lares Valley, sees few travellers despite its proximity to Cusco. Most are hell-bent on getting to Machu Picchu as quickly as they can, leaving these tasty morsels in between. Here, farmers tend to their crops while balancing on slopes so drastic, I expect to see them cartwheel all the way down to the valley floor. Cars can barely pass on these roads; on several occasions we’re forced to reverse to make way. If you’re prone to vertigo, this is not the road for you. We take hairpin corners across soaring, yellow-fringed mountains on which ancient forts teeter, finding our way through a barren pass. Above us, glaciers sparkle in the morning sunshine, while waterfalls thunder down on the side of the road. The vegetation changes from rugged high-country tundra to rich, green jungle with trees forming cathedrals above the roadway, as a river swirls angrily past, squeezing itself between rugged escarpments of rock. We drive to the historic town of Choquecancha, entirely shut off to tourists until only last year. The village balances precariously on a mountainside, and I walk through town as piglets and chickens sprint between cacti and pretty red, yellow and white flowers. The village’s children come out to look at us shyly, while adults carry on with their farming duties. Hoofs of slaughtered animals are hung out for smoking over chimneys fired by straw and wood. The 1000-year-old Inca Trail, from Quito in Ecuador to Cusco, runs right through this village, and I walk along a section of it to climb to a statue of Christ on the mountaintop. From here I can see forever across a huge valley to the rainforest far below. We drive to the newly constructed Huacahuasi Lodge, which sits across a ridge overlooking a valley where alpacas feed. In the dining room, floor-to-ceiling windows look right out across a waterfall and a zig-zagging river. From my balcony at night, the stars look so close at this lofty elevation that, when they shoot across the sky, I see every inch of their fiery freefall. After a breakfast prepared by locals, who staff all of MLP’s lodges (providing guests with local interaction and locals with new skills), I prepare for the toughest hike of the trip. It will take me to 5000 metres above sea level, and to temperatures nearing zero degrees (there are alternative options today, but I’m feeling brave). My group is decked out in every conceivable shade of Gore-Tex, which swishes as we walk, but five minutes in we’re humbled by a mother and her two tiny children who walk past us on the single-file trail in bare feet and light, woollen traditional clothes. There will be no tourists on this trail today; the only folk we see at all are high-altitude potato farmers who shuffle back and forth, tending to their plots. A wet mist shrouds my path, and when it opens up I see a huge plateau of rich, green mossy grass where llamas and alpacas feed. Then the cloud comes in once more and we reach the top of the pass as a cold wind blows us sideways. We take shelter inside a hut, just below the ridge overlooking a lake. Our chef has hiked ahead to prepare a three-course feast to gorge ourselves on as we thaw out beside a fire. As we leave the shelter, the sun comes out for the first time today and I see a huge valley ahead. Beyond it, a 6000-metre-high mountain stretches all the way up to the heavens. The narrow, dusty trail spirals its way along a plateau, and when I look ahead I see not a soul. I may as well be the last man left on Earth. By mid-afternoon we reach the village of Patacancha in time for a Sunday market. We’re the only foreigners and our presence draws attention; it’s me who feels on display as locals stare shyly. We drive along narrow dirt roads to the town of Ollantaytambo, the gateway to Machu Picchu. After the sheer isolation of where we’ve been, walking amongst large groups of foreign tourists feels stifling, so we escape to a traditional restaurant chosen by Sutta, and go back into old-world Peru. I opt to wake at dawn, when most tourists are still tucked up in their warm beds. Ollantaytambo is a village that dates back to the 13th century. I walk along its narrow, cobbled streets; between its crumbling stone buildings, trees protrude laden with fruit. Below us plantations of quinoa, corn and potato grow in the misty, green Urubamba Valley. While visitors come in their thousands to see the town’s famed Inca ruins, we hike up a narrow stone staircase located behind a secret laneway, which twists and turns along a steep mountain face to the quiet ruins of Pinkuylluna – a 15th-century Incan storehouse built by the great Incan emperor, Pachacuti. There’s just three of us here, up high above the last remnants of the doomed Incan Empire. When we descend we walk through the famed fortress and temple of Ollantaytambo, the site of one of the most significant battles between the last Incas and the Spanish conquistadors. But observing the ruins with others (though MLP chooses the least busy times to visit the popular ruins on its itinerary) makes me long for the complete silence of Pinkuylluna, and the solitude of Huacahuasi. The train ride into Machu Picchu town (Aguas Calientes) follows a fast-flowing river with mountains on each side, and now I see clearly that we’re descending into the jungle. 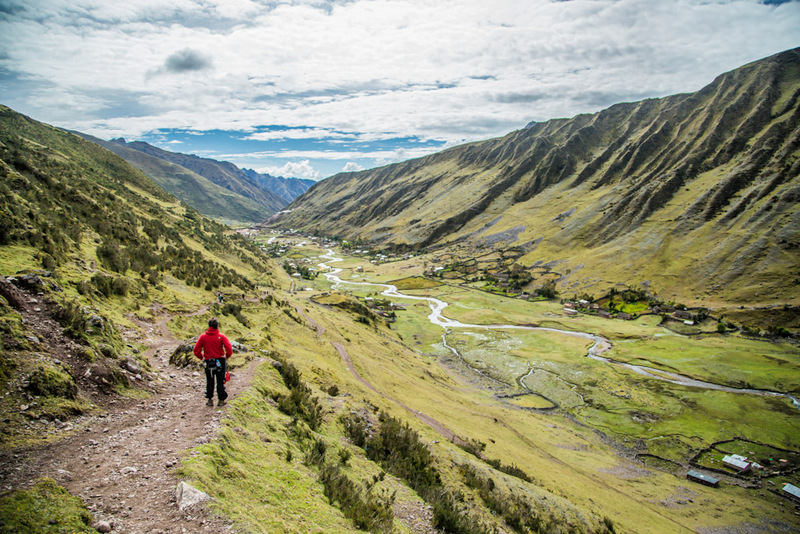 On some of the hairpin corners we see hikers on the Inca Trail – there can be thousands on the trail at any one time, and hikers must camp in tents overnight. It’s an entirely different experience to the comfort of our expedition. It’s busy in Aguas Calientes but we have a retreat ready. We’re booked into the Inkaterra Machu Picchu Pueblo Hotel, a five-star and private oasis in the cloud forest just beside town. Hummingbirds hover in the gardens here beside honeypots hanging from trees. This is jungle where 372 native species of orchids grow and 111 species of butterfly live. A porter escorts me to my whitewashed adobe-brick room, beside a pool surrounded entirely by forest. We rise at 5:30am, anxious to beat the crush of tourists visiting one of the world’s ‘New 7 Wonders of the World’. More than 1.4 million tourists will visit Machu Picchu each year and, even at 6am, the line-up for buses for the short journey up the road to the ruins measures 500 metres. Buses pass centimetres apart on a narrow dirt road. Outside I see the roadway drops a kilometre or more to Aguas Calientes directly below me. My first glimpse of Machu Picchu is through misty clouds; it’s a kingdom in the sky built across some of the most rugged mountains of Peru. 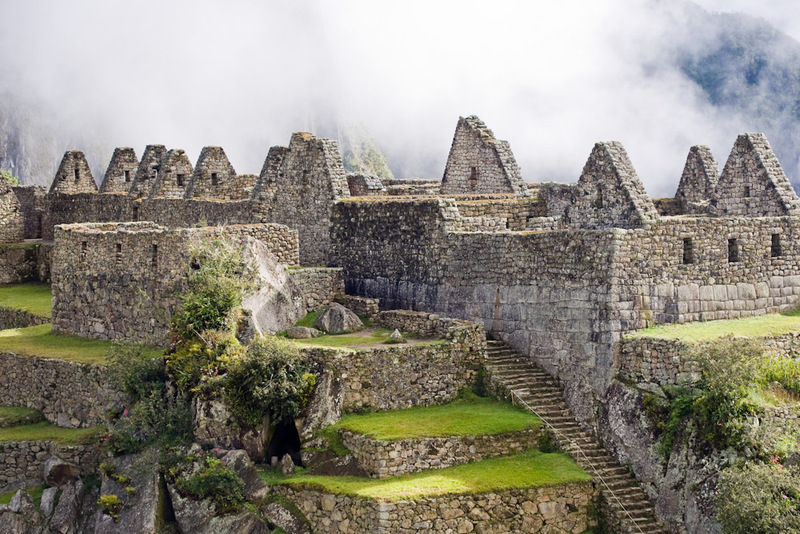 More than 200 structures, built by ancient Incans in the 15th century, are crisscrossed on a steep ridge of stone terraces. Tourists in khaki (so much khaki, like a world full of Irwins) make their way to the entrance. The first sun rays of the day hit the temples and I look out across the ridge to the karst-like mountains above. It’s truly one of the great sights of this world, but thousands of others share my view and I’m pushed aside by tourists brandishing selfie sticks and guides with flags flying, and I’m stepped on by day trippers in stilettos. It’s as I walk through the busy corridors of the famed Incan citadel that I comprehend just how fortunate I’ve been to observe a culture virtually unchanged just a few valleys from here, but where few of the thousands around me will ever tread. I miss the solitude of my mountain hikes, and the peace and quiet of the lodges built in secret valleys amongst farming communities. It’s there – just a few kilometres from this human conveyor belt of tourists crossing off items on their bucket lists – that I can truly journey back deep into the heart of the ancient Incan empire. Preparation: Participants are encouraged to prepare by exercising regularly, having a healthy and balanced diet, and spending at least two nights in Cusco prior to setting out in order to acclimatise to the altitude. Getting there: LATAM Airlines operate seven one-stop flights each week from Sydney to Santiago (connecting in Auckland), and three direct flights weekly from Sydney to Santiago in codeshare with Qantas, with onward connections to Cusco. 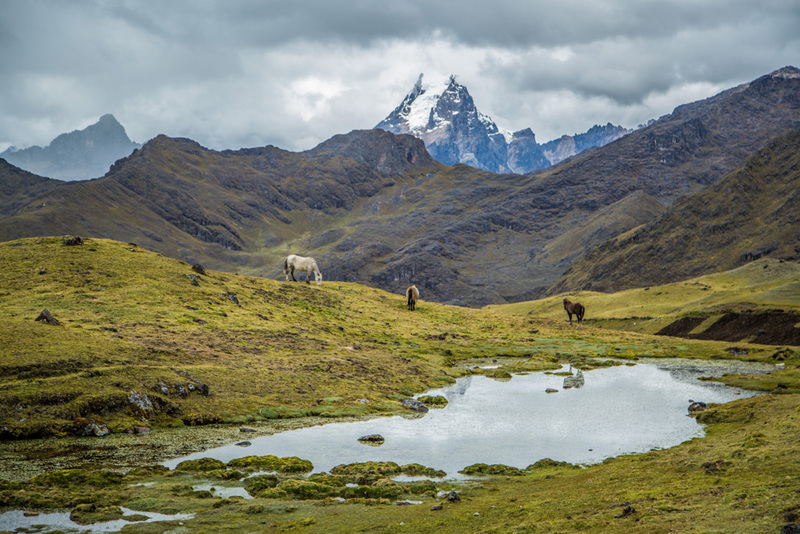 Playing there: There are two options for The Lares Adventure To Machu Picchu expedition with Mountain Lodges of Peru: a five-day, four-night adventure for $3122 or a seven-day, six-night adventure for $4093, including all meals and accommodation. 1. Hotel El Mercado – Part of the old farmers’ markets, and now a boutique hotel of 32 rooms; from $276 for a Superior Single Room. 2. Aranwa Cusco Boutique Hotel – Housed in a refurbished 16th-century mansion filled with antiques and chandeliers; from $262 for a deluxe room. 3. 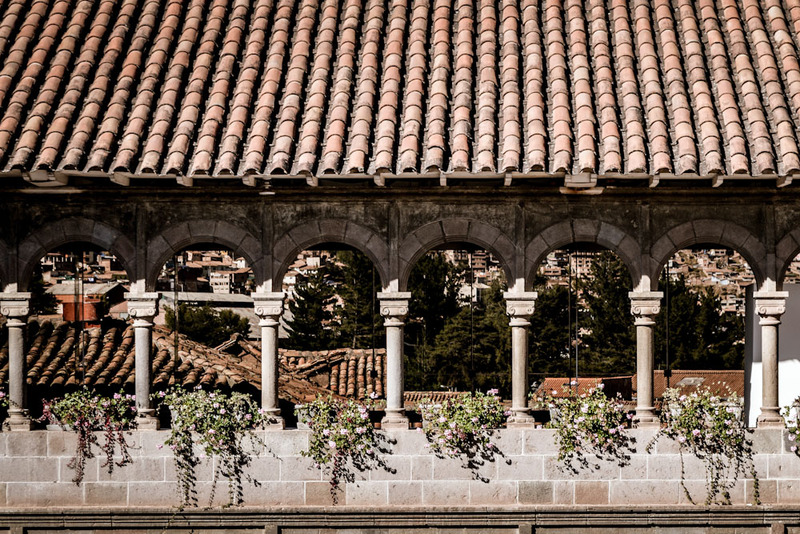 Palacio del Inka – Dating back 500 years but resolutely modern throughout; from $234.